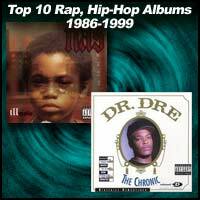 Criteria: These Top 10 Must Listen To Rap/Hip-Hop Albums for each year 1986-1999 were ranked based on popularity, innovation, and overall quality of music. 1. Life After Death - The Notorious B.I.G. 2. Ready to Die - The Notorious B.I.G. 6. Runaway Slave - Showbiz & A.G.
6. No One Can Do It Better - The D.O.C. 2. Straight Outta Compton - N.W.A. 1. D.M.C.- Raising Hell - Run-D.M.C.